I've downloaded Universal Control 2.1 - PC and I can't get the Monitor Mixer.. I've clicked on the picture of the 1818VSL but nothing.. Doesn't exist? I've had to reload AudioBox 1818VSL v1.3 - PC again and delete the Universal Controller .. Will there be an update for it so we can use the Monitor Mix on Universal Controller with the VSL1818? There is no monitor mixer software in the control panel for Universal Control 1.8 or later that support AudioBox VSL series interfaces. You will need to set this up in your DAW. We have instructions on how to do this with Studio One, if you're on another DAW you'll need to set this up on your own. 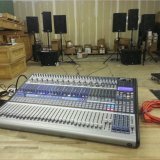 But could a shop just replace my two XLR/1/4" inputs instead of PreSonus? Isn't that a universal part? Can you open 2 sessions in Surface to control using 2 Monitors with 1 PC ?